Let’s talk about the best chest rigs available in 2019. First – what’s a chest rig? It’s a piece of tactical gear used to carry necessary items within easy reach for your mission. They are an efficient way to carry necessary and important gear and to make it accessible quickly at all times. 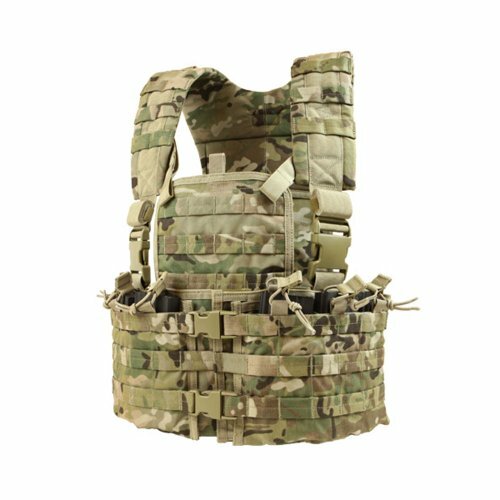 Just as important – what is NOT a chest rig? 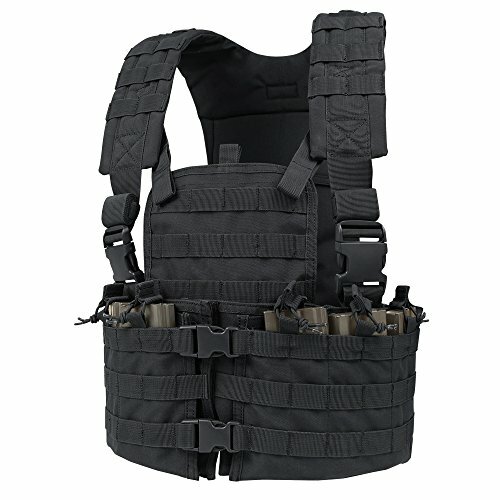 A plate carrier. 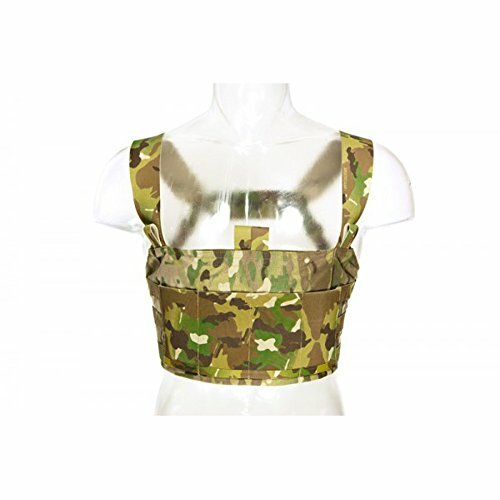 While those modular body armor items can also be used to carry extra gear – a chest rig can’t hold ballistic plates. 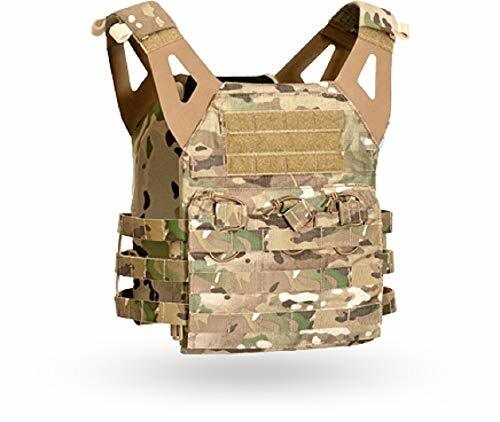 Therefore a chest rig is a lighter weight, more streamlined, and more maneuverable option for those that don’t need armor, but still have a lot of critical gear to carry. These rigs typically come in two flavors – an H rig and an X (or cross-back) rig. What’s the difference? A picture is worth a thousand words. Some rigs even let you reconfigure as X or H, based on your preference. These use keepers to help reconfigure the harness straps. As you can see, the configuration of the harness straps is what gives it the name. In either case, these straps help distribute the load, and reduce pressure points. What can you carry in your chest rig? How about: mag pouches, radios/comms gear, flashlights, maps, dump pouches, IFAKs, multi-tools, knives, and other important hardware. And a near universal feature of these is MOLLE – or more accurately MOLLE/PALS webbing that let’s you customize how you carry your gear. 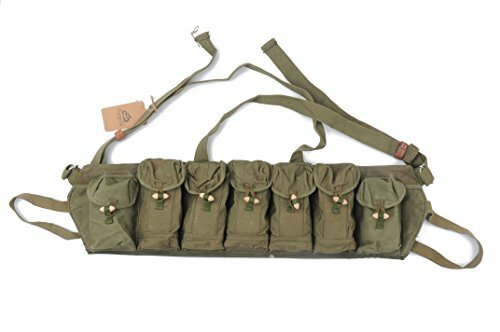 Some rigs have a number of mag pouches or other storage already included, while others provide nothing but MOLLE for you to customize. A split front chest rig has one or more zippers or buckles front and center. 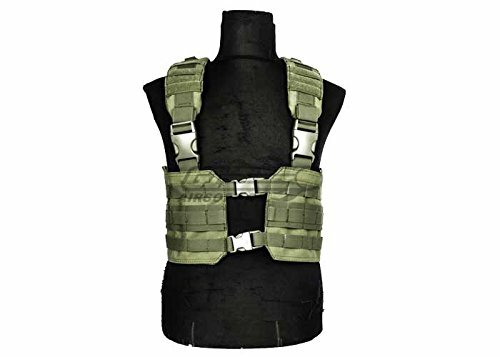 Along with adjustable straps these can be used over body armor. 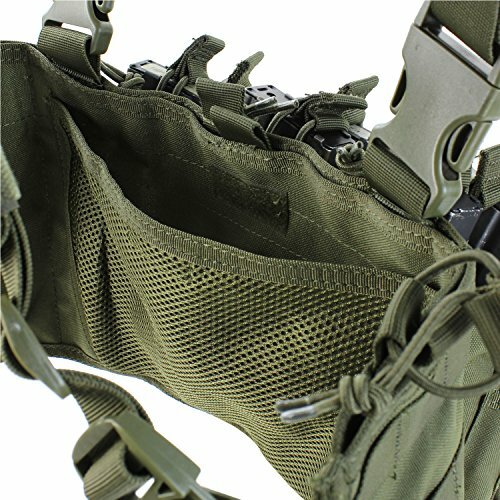 The split chest rig can be handy if you need to go prone – you can unzip or disconnect the center buckles and still have relative easy access to magazines and pouches. In fact, that’s the primary reason to choose a split chest rig. Bells and whistles you may want? How about padded shoulder straps, waterproofing treatments, and quick-release buckles for a starter. There’s really a wide range of products to look at. Other considerations include how bulky or streamlined your chest rig is. Will you need to enter and exit a vehicle or other seated location frequently? 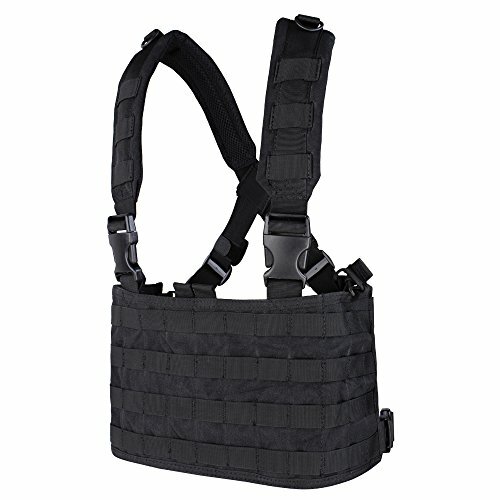 The D3CRX Chest Rig (Buy on Amazon) from Haley Strategic Partners is an excellent chest rig. This is also known as Disruptive Environments™ Chest Rig X. This is an “X” harness, as you can see. Shown here is the Coyote Brown color option. It has 4 rifle magazine pouches, sized for AR magazines, as shown. 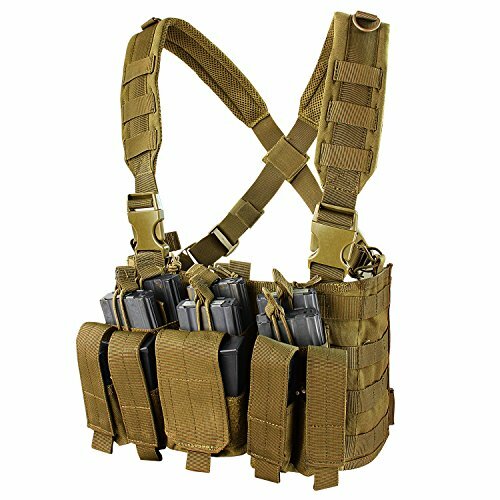 4 additional pouches can accommodate single stack or double stack pistol magazines, mini-tools, or flashlights. And lastly, there are two “multi-mission” pouches with a flap on each – to accommodate other gear. 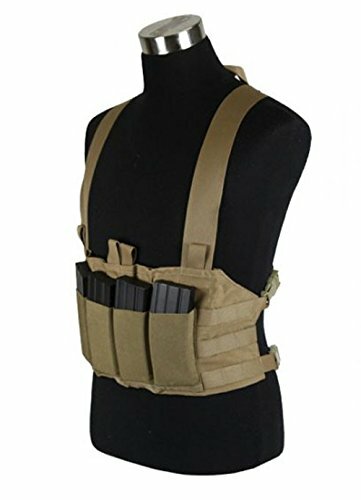 Is this an expensive chest rig? Yes. But it’s “pro” quality equipment. It’s also available in black (Buy on Amazon) or Multicam (Buy on Amazon), as shown below. Need a more affordable option that is still tough? 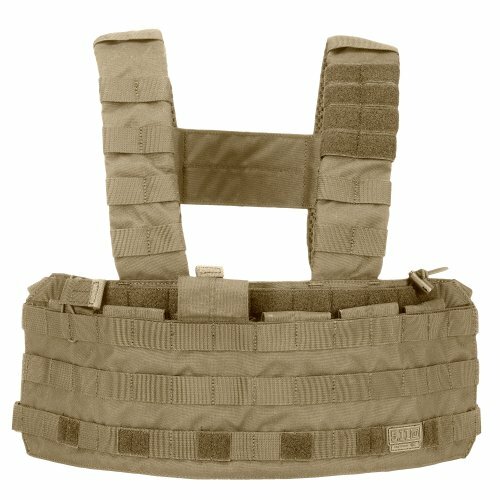 Here’s a chest rig from 5.11 tactical. 5.11 gear is usually a solid choice. It’s typically well made, and highly functional – but not over the top expensive. Check the reviews on this item and you’ll see. 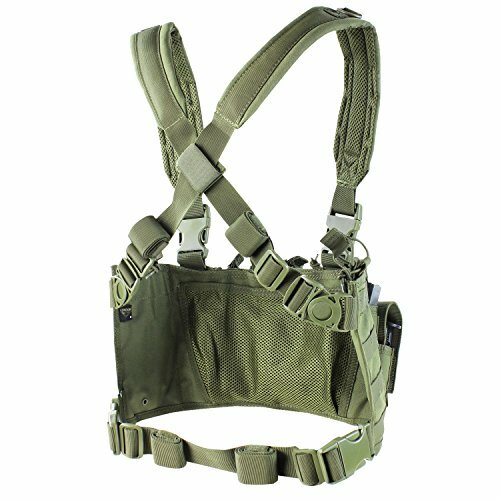 Need a low-profile, but quality chest rig? Look at the Blue Force Gear Ten Speed M4 Chest Rig (Buy on Amazon). Will hold four M4 mags in the integral mag pouches. This is a streamlined chest rig without too many frills – but it’s from a name known for high quality gear. There is a map/admin pocket, a drag handle, and place for name tapes on the back though. For LARP activities you can probably get away with a budget Chest Rig. 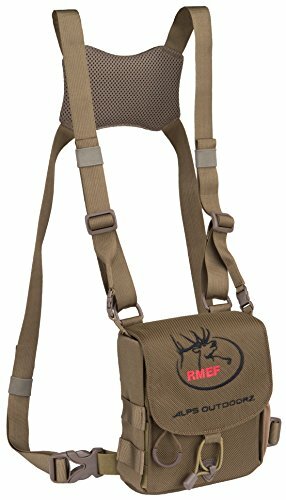 Condor Recon Chest Rig Coyote, Brown, 30" - 60"
The Condor Recon Chest Rig (Buy on Amazon) is a basic cross back (or X) harness rig with dedicated mag pouches. Condor is a popular name in tactical gear – they make robust and durable gear, at affordable prices. This model has a lot of mag pouches. The 3 built in stacker/kangaroo style mag pouches can hold 6 M4 mags and 6 pistol mags. These have a splitter in each pouch to keep two mags separated, as well as elastic cord to keep them secure. The mag pouches are permanently attached (stitched to the rig). There are two MOLLE sections on the left and right. 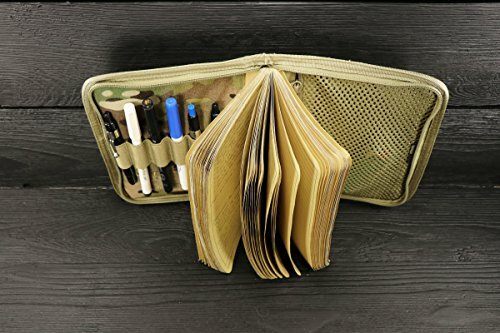 Those MOLLE areas can be used for items like an IFAK, Tourniquet, radio, or other MOLLE pouch. As such, Condor has sacrificed some amount of modularity with this choice – but this is a very affordable chest rig. Lastly, there is a mesh map or document pocket on the inside. Let’s look at another option. If you like the price tag and general feature set of that rig, but don’t want or need those mag pouches, check out the (Buy on Amazon). This is also a X (cross back) rig – with the padded shoulder straps, quick-release buckles, and D-rings. But, instead of mag pouches permanently stitched to the rig, we get MOLLE – lots and lots of MOLLE. The MOLLE panel is 21″ x 8″. Available in Coyote Tan or Black. 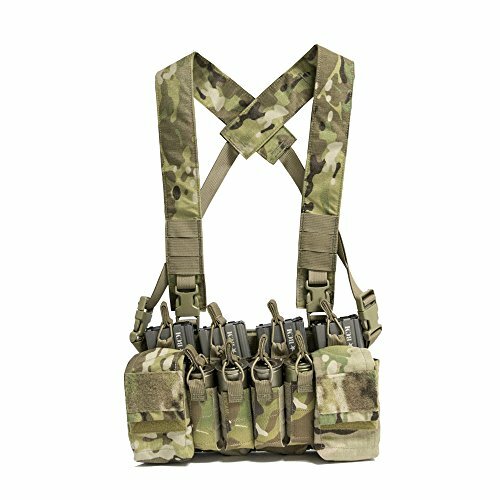 The Condor Ops Chest Rig is a great budget option when you want a fully modular solution. Here’s an H rig option. 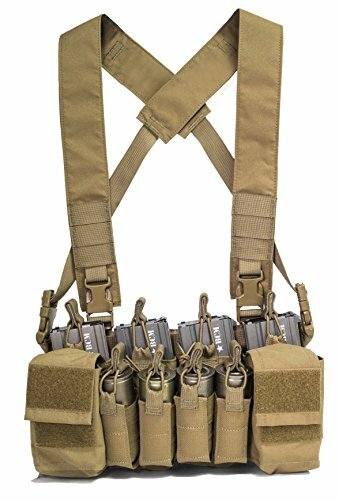 The Condor Ronin Tactical Chest Rig (Buy on Amazon) is not just an H rig – it’s also a split chest rig. The fully padded H-Harness has hook & loop (velcro), D-rings, and webbing. But most importantly you can see the split buckles up front. As with most all split rigs, this means less room to carry stuff. But it’s also more open and breathes better. So, take into consideration how much do you have to carry , and where? Here’s another option from Condor in Crye Precision’s Multicam pattern. This piece of kit from Condor has a lot of options. It’s the Condor Outdoor Modular Chest Set, Multicam (Buy on Amazon). First of all, it’s using Crye Precisions Multicam camo pattern, so it’s a little more expensive than other colors. But it’s got integrated mag pouches AND a integrated MOLLE chest platform. Also available in other colors, for a bit cheaper. 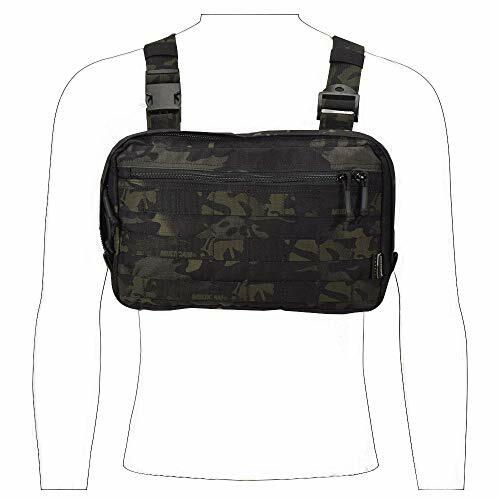 Maybe a full chest rig is overkill – maybe you want to keep some essential gear within easy reach, but you don’t need a multitude of pouches or magazines. In that case, take a look at chest bags. EMERSONGEAR Designed the Runner's Kit Bag specifically for carrying a pistol or similar-sized gear while running in urban environments. It also works well in higher activity situations (running, mountain biking, rock climbing) where you would like to discreetly carry a handgun, cellphone, pepper spray, or other small items. This chest bag from Emerson gear has one large zippered pocket, and MOLLE in case you want to attach other gear and accessories. As you can see, it is worn high on the chest. It’s a simple, robust solution for those with particular needs. Looking to keep your binoculars secure and close at hand? You may need a bino rig or bino harness. 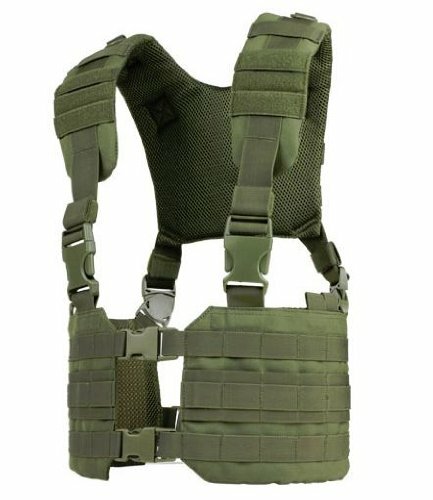 The Ridge Stalker X Harness (Buy on Amazon) will fit the need. It’s an “X” style harness and the fleece lined compartment for your optics even as a lens cleaning cloth built-in. Don’t let your swinging binoculars get in the way – keep them safe and secure – but still easy to reach. Dimensions: 6.5" x 5.5" x 2.25", Weight: 12 oz. Chinese military surplus Type 63 (Buy on Amazon) and Type 81 (Buy on Amazon) chest rigs are very cheap – sometimes less than $20. Any drawbacks to using these? These are not a modern design, not by a long shot. They are made more for retention instead of fast access to mags and gear. They are sized for AK 20 round and 30 round magazines, not AR magazines. The mag pouches are bigger than what is needed. They are very minimalist, X harness, made from simple canvas. That can be a plus, if you are looking for something simple. The magazine pouch flaps are designed for retention of the magazines, not quick access. Speed reloading may be trickier. The Type 63 is quite an old design – and made more for SKS stripper clips than magazines. And, did we mention they are really cheap? 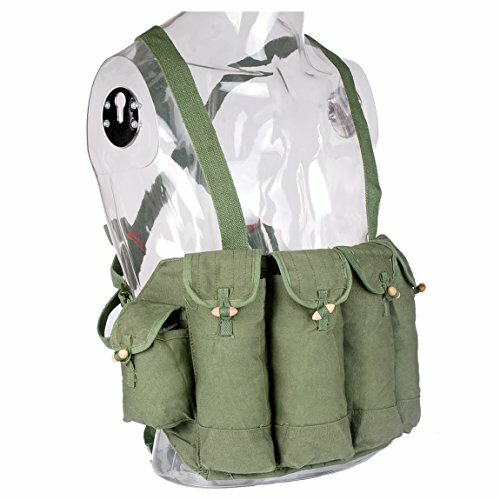 A chest rig is a basic piece of tactical gear. There are H harness and X harness options. Some have integrated mag pouches, some have nothing but MOLLE – and some have both. 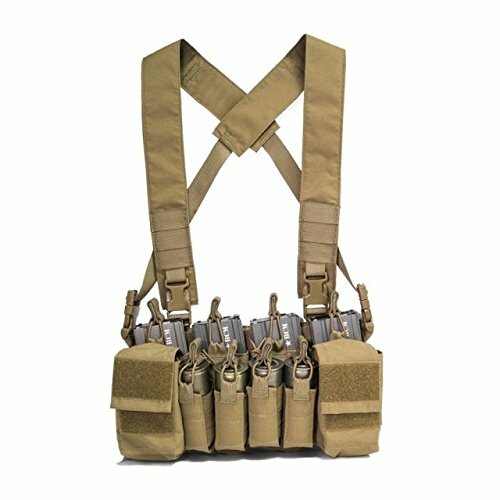 After you choose a good chest rig for your needs, you might want to look at our article on MOLLE clips.